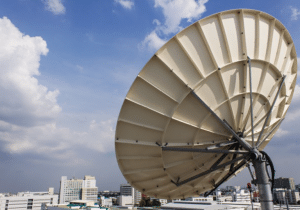 Satellite industry experts and space providers alike believe there are anywhere from 20 to 25 thousand of US broadcasters currently using C-band fixed antennas for the delivery of hours of daily programming. Yet, there still seems to be some…hesitation? procrastination? denial? from broadcasters when it comes to the voluntary registration process currently being solicited by the FCC. These ambivalent feelings are evident in the current number of filings. As of last week, approximately 6,600 downlink sites have registered with the FCC in response to the government agency’s call for all C-band earth stations to identify themselves, their fixed antennas and their locations. A far cry from the expected 15,000 industry experts were expecting at this point, and the last day to file these registrations is October 17, a mere SIX weeks away. There’s a battle going on for satellite’s mid-band frequency. Mobile data giants like Verizon, Sprint and Google want complete access to the frequency between 3.7 and 4.2 Ghz for the expansion of 5G broadband across the country. Unfortunately, the broadband industry seems to give very little consideration as to how their unfettered signal will affect C-band’s pin-point reception. The complexity of Form 312. Yep, the form asks some nit-picky questions – answers that one could arguably claim the FCC really doesn’t need. Simply knowing the location of all C-band earth stations should be sufficient, right? The $435 dollar filing fee. It’s a real hardship for many broadcasters to pay for multiple downlinks spread across a region. It’s worth noting that multiple downlink C-band antennas at a single location – like the same address – can be filed by using one form 312 and paying a single fee of $435. It’s a royal pain in the neck. Let’s face it – complex forms? Filing fees? This proposal to “share” the frequency with 5G? All this contributes to that squeamish feeling in the pit of your stomach that all of this hoop-jumping is all for naught. Whatever it is that’s keeping you from taking action, get over it. The future of C-band as an affordable delivery method for US broadcasters is in jeopardy. PERIOD. If 5G is given unbridled access to the mid-band frequency, broadcasters using C-band for content delivery will face serious signal disruption. So what are you waiting for? If you have not registered your C-band downlink(s) with the FCC, do so today. Go to the FCC website and download Form 312. Registering your earth station(s) not only tells the FCC that you are there, but that – by registering – you expect consideration. It also reiterates what satellite providers like SES and Intelsat have been saying to the FCC all along; C-band heavily populates the frequency between 3.7 and 4.2 Ghz – more than the FCC or the mobile carriers would like to believe. To encourage this crucial registration, space providers SES and Intelsat are offering to help. Between now and October 17, SES is operating a Phone Helpline at (609) 987-4300, answering questions regarding how best to fill out the FCC’s Form 312. Remember: The FCC will ONLY give consideration to broadcasters who have registered their C-band downlinks. Registering your earth station(s) not only tells the FCC that you are there, but that – by registering – you expect consideration. Another concrete reason that you should register your C-band downlink(s). Today.